The process of fundraising, meaning gathering the contributions of money on the voluntary basis in a way of requesting donations from different people, different businesses and charitable foundations, as well as governmental agencies, becomes more and more popular these days, being a significant component of any charitable organization activity. Such activity can be referred to making some efforts in order to gather some definite amount of money working for some non-profit organization. Although, the term “fundraising” can sometimes be used for refer to the solicitation and identification of investors as well as other sources of capital for such for-profit enterprises as charitable organizations. Usually, fundraising is treated as the process of asking for donations on the ongoing basis. It can be done on the street wondering if people want to support some particular idea or some organization as a whole, or those who are in charge for fundraising come to people's doors asking for donations. The last mentioned method is known to be the one experiencing a very strong growth nowadays, as such face-to-face fundraising is known to be the most effective. At the same time, there are many new forms of fundraising exist, such as an online one being emerged and highly successful in the recent years. Although, even online fundraising is often based on the old methods such as so called “grassroots” fundraising. The mentioned “grassroots” movement is often known to be referenced to a political one, but it is basically the one that uses people standing in some district on the street supporting some economic or political movement. The grassroots organizations are known to be using the collective actions from the very local level for effecting some changes at other levels, such as regional, local, international or simply national ones. Such movements are usually in association with the “bottom-up”, not “top-down” decision making. Sometimes they are considered more spontaneous and natural comparing to the more traditional power structures. Using self-organization, all the grassroots movements try to encourage all the community members to contribute in a way of taking the responsibility as well as some action in order to support their community, utilizing a couple of different strategies, including registering voters, apart from the fundraising methods, described earlier. Sometimes the members of such organizations try to simply encourage the political conversation, having their objective to increase the mass participation in politics. Beginning as small operating at the local level, the mentioned political movements try to shape the progressive politics by bringing public attention to the regional political concerns. Thus, fundraising is a very commonly used and significant way for non-profit organizations, such as the mentioned “grassroots” ones, to obtain the necessary amount of money for supporting them in a way of investing their operations. The operations within the term of fundraising are known to be involving lots of different concerns, including the religious as well as philanthropic groups: research organizations, political campaigns, environmental issues, public broadcasters, etc. Some of the charitable organizations even offer the student scholarship merit awards for academic or athletic achievement, ecological and humanitarian concerns, disaster relief, research, human rights, and many other different social issues. Universities and colleges in the United States of America are mainly in charge or conducting the questionnaires, developing the surveys and doing many other things as part of the main activity — fundraising. Such development programs make a distinction between major campaigns and usual annual fund appeals. Most of the institutions use their hired professional officers for developing and conducting the superior fundraising appeals. Such officers may work for individual colleges, some particular departments or different institutions. The examples may be libraries and athletics. Similar fundraising efforts are also known to be arranging by most of the religious groups all over the world, being organized on both national and global levels, as well as on a local one. From time to time, such funds start assisting the very basic needs of other people and the collected money may be used only for a certain reason, such as for a particular religious group of people. Knowing that a fundraising plays a huge role in different political campaigns, it is well-known for being a highly controversial topic in American politics. For example, the political action committees are the most widely known organizations, especially in the United States of America, for backing their candidates as well as political parties through others. Also, a few advocacy organizations are nowadays involved in the process of fundraising for so called “for-or-against policy” issues in order to influence the legislation. Working for a fundraising organization, you may face a need in creating a diagram explaining the way the company you work for, operates. Thus, you can always use any of the existing nowadays applications. Although, it is always better to use the best or at least one of the best products, such as ConceptDraw DIAGRAM diagramming and drawing application. Having ConceptDraw DIAGRAM can simplify your work with making lots of different drawings, such as diagrams, including the triangular ones, such as pyramids. Downloading the mentioned software from this site will enable you to make any needed charts, flowcharts, maps, plans, schemes, diagrams and other schematics and downloading another product of CS Odessa — ConceptDraw STORE — will enable you to do all the needed drawings much quicker. So, having the Pyramid Diagrams solution from the ConceptDraw STORE application will simplify your work of creating the needed triangular diagrams, such as pyramids. 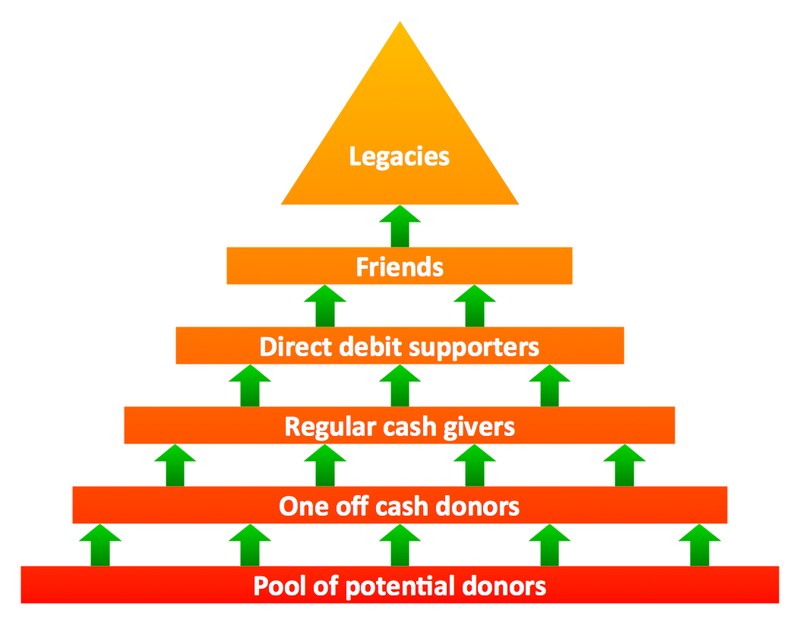 This fundraising pyramid diagram for community based cash donors was redesigned using ConceptDraw DIAGRAM diagramming and vector drawing software. Create bar charts for event management problem solving and visual data comparison using the ConceptDraw DIAGRAM v12 diagramming and vector drawing software extended with the Bar Graphs Solution from the Graphs and Charts area of ConceptDraw Solition Park. The purchase or purchasing funnel is a consumer focused marketing model which illustrates the theoretical customer journey towards the purchase of a product or service. Zooko's triangle is a diagram named after Zooko Wilcox-O'Hearn which sets out suspected tradeoffs for a system for giving names to participants in a network protocol. 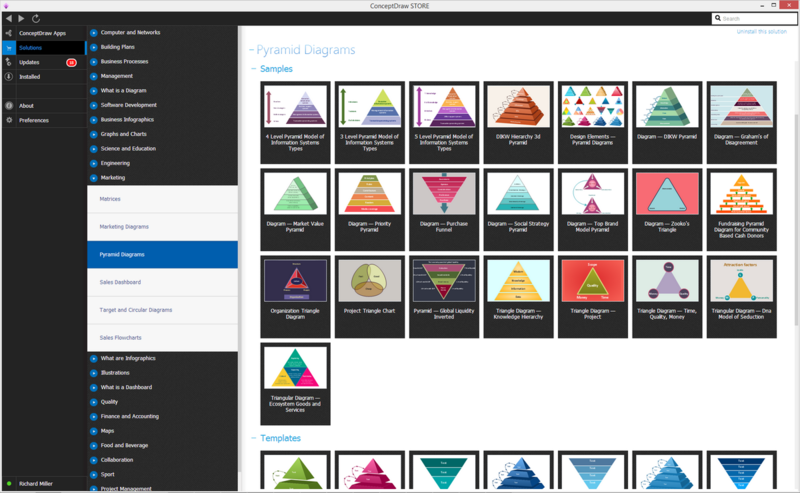 Pyramid chart example is included in the Pyramid Diagrams solution from Marketing area of ConceptDraw Solution Park.